Sorry, but I will be working late for the next couple of nights so I won't be able to update this post until Thursday or Friday. But rather than leave you all hanging (especially you Clinton and Kirk)...ENJOY! 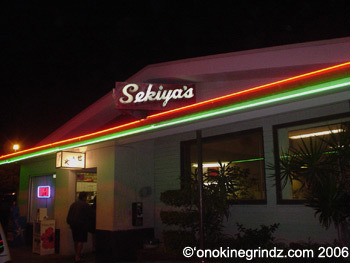 Located across from Kaimuki High School, Sekiya's has been serving local-style homecooked favorites for almost 50 years. Starting in 1957, generations of locals have grown up eating the food served here, and everytime I visit, I'm reminded of some of my favorite home cooked dishes -- saimin, pork tofu, beef tomato and butterfish nitsuke. 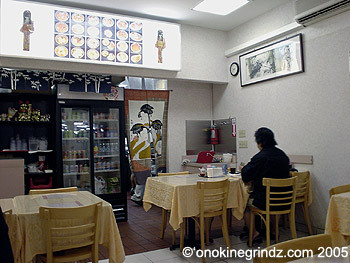 As you enter the restaurant, the first thing you'll notice is the okazuya counter. During the day, the warmers are filled with many different dishes that are combined to create your very own "mixed" bento box (plate lunch). Since I almost always visit at night, this area is usually closed. Inside, there are a number of booths with can accomodate 3 or 4 dozen people. Near the "wall of glass" at the far end of the room are a few tables that will accomodate larger parties, and right outside, is a Japanese garden. The last time I was here, I dined with a friend who lives nearby. For some reason, my friend had never been here and wondered how the food was. After we looked over the menu, and place our orders, we sat and waited for the food to arrive. First to be delivered was a pot of tea, a bowl of rice, a dish of tsukemono and a bowl of miso soup. When eating a local Japanese restaurants, these are the things that will most accompany your meal. 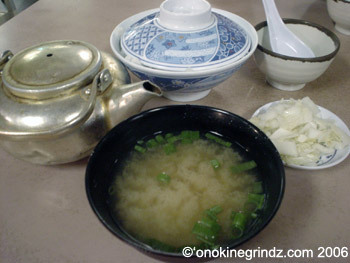 The miso soup contained cubes of tofu and lots of chopped green onions. 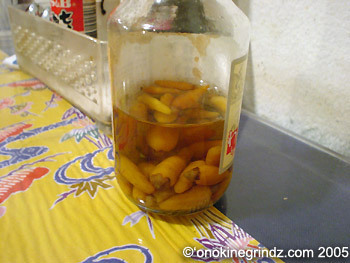 The tsukemono (Japanese pickles) served here consists of salted Chinese cabbage. 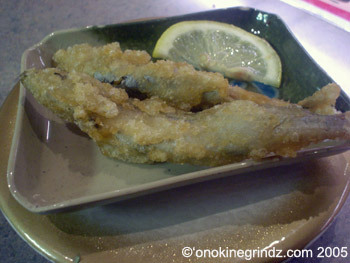 Soon after, the hash tempura (6 pieces, US$4.50) arrived at the table, fresh out of the fryer. 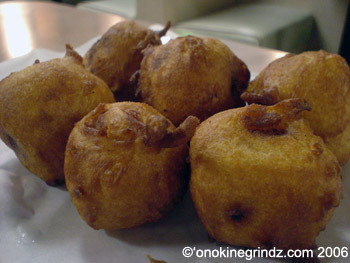 Corned beef is mixed with potatoes and various seasonings before being rolled into balls, covered in batter and deep fried. Piping hot, I took the first bite. The first thing I tasted were the creamy, slightly sweet potatoes inside. It was only then that I noticed the lack of actual corned beef. It was quite surprising that these weren't as good as they usually are. This was my friend's choice, the oyako donburi (US$7.95). 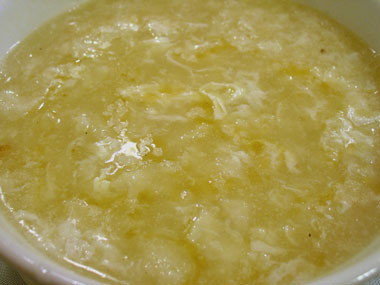 Slices of onion are cooked with pieces of dark meat chicken in some dashi before the egg is added. 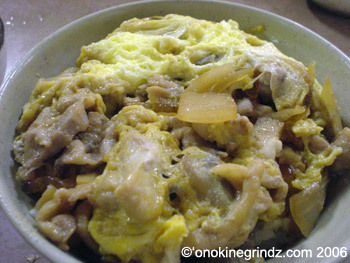 The egg left a little "runny" and is served in a bowl over hot rice to create the donburi. Here the rendition is pretty straightforward, but I believe they used just a little too much sauce. Tonight, I decided to sample the nitsuke butterfish (US$13.25, with tofu add US$1.00). 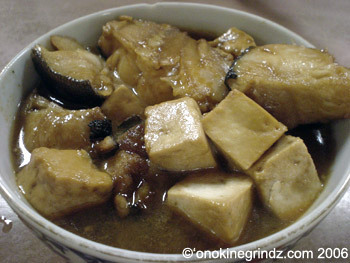 Cubes of tofu were combined with pieces of butterfish in a classic nitsuke "sauce" (flavored with shoyu and mirin among other things). The "sauce" was well seasoned, and neither too sweet nor too salty for my tastes. The pieces of butterfish had a very "fishy" aroma and consisted of many small pieces full of bones. This dish would have been much better had it been prepared using a single butterfish "steak" rather than chopped up, leftover pieces of butterfish. In my opinion, over the years, the quality of the food at Sekiya's has slipped as the prices have increased. It has often left me wondering if the changes in ownership has been the cause of this. Granted, there are quite a number of dishes that remain favorites, but for a few others, there are many other places that serve food that tastes just as good, or better, and are a lot more reasonably priced. I'm not really one to visit "robot" sushi places as I think I'm a little old fashioned. You see, I like to be able to interact with the guys behind the sushi counter -- talk to them about what's fresh, and most of all, find out what they enjoy. 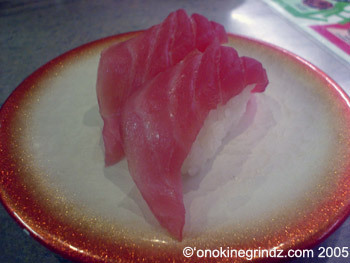 This was my first ever visit to Genki Sushi, and let's just say that it might not be my last. A couple of weeks ago, after spending a few hours at the mall, I was asked if I was hungry. 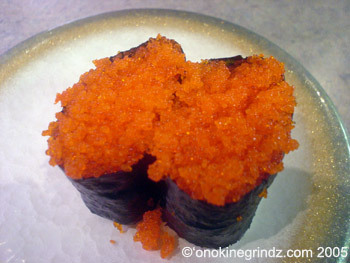 When I said yes, my friends asked if I had ever been to Genki Sushi. Well, once they discovered that I had never eaten there, they told me that I didn't know what I was missing. When we arrived, it was about 8:15 pm, and there were a few people there. 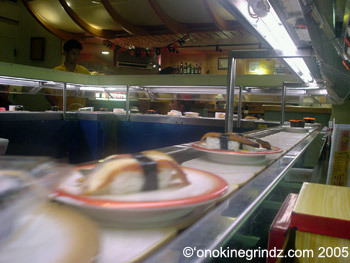 It was strange to see the plates of sushi going round the room on a little conveyor belt. What I didn't know at the time was that you could actually "order" sushi off the menu. There were quite a number of choices available here -- much like you'd find in any sushi bar, except at 1/3 to 1/2 the price! The prices start at US$1.35 for a "gold" plate, US$1.90 for a green one, US$2.45 for a red one, US$3.60 for a silver plate, and the most expensive plates, the "black" ones, are US$4.40. This sort of tiered pricing system can either work for you or against you. 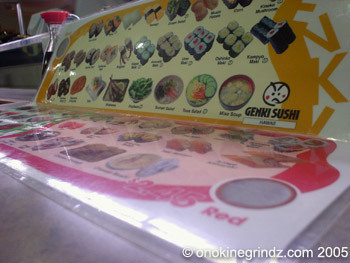 As you can see in the picture below, the items are pictured in the corresponding "plate" section of the menu so you know what to look out for on the conveyor belt. The photos above represented a small sample of what we actually ate. As you can see below, we enjoyed a few more dishes that were not photographed. While the sushi here may not be of the best quality, the ingredients seemed fresh and some of the items sampled were just as good as any that I've had elsewhere -- the chicken karaage and the vegetable croquette come to mind. The sushi is worth the price and now that I know about ordering from the menu, I'll be sure to visit again. After making a few calls this afternoon, a few of us decided to get together tonight for dinner. Since everything was planned at the last minute, we wanted to go somewhere that didn't require reservations and that didn't require us to get dressed up. 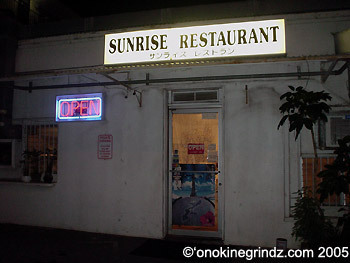 Someone suggested Okinawan food, and since it was still early, we ended up here at Sunrise. As you enter, you can hear the sound of Okinawan music as it fills the room. The restaurant is small and cozy, with seating for about 25 people. It was quite busy when we arrived as there were only a couple of tables available. Besides a few specials listed on a couple of boards behind the sushi bar, the dinner menu is quite short. Actually, there are 10 different items on the regular menu to chose from. On the bottom of the single paged menu are the sushi combination dinners. While snooping around in the condiment tray, which is something that I often do, I noticed this. Anyone know what it is? I wanted to open the bottle to smell the contents, but I decided not to. These actually looked like pickled chili peppers if you ask me. 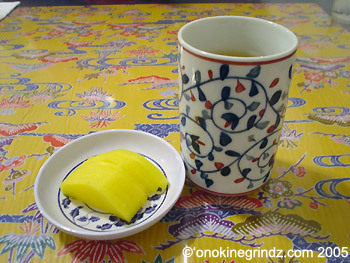 After placing our orders, the first items to arrive were the tea and some takuan (pickled daikon). 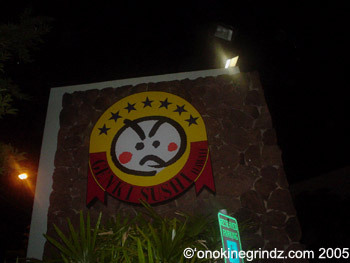 Two of us ordered the sushi combination with Okinawan soba (US$12.00). 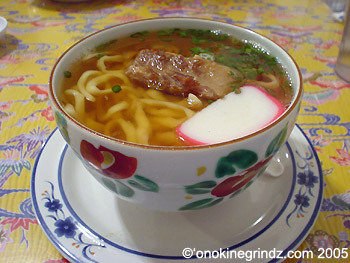 Topped with a tender, meaty pork rib, the soup was further garnished by a lone slice of kamaboko (fish cake) and some chopped green onions. The bowl here was on the small side, but it was full of noodles. The broth was clear and had a meaty, slightly spicy flavor. After eating some of the noodles in the bowl, I was surprised to see lots of benishoga (shredded pickled ginger) in the broth. 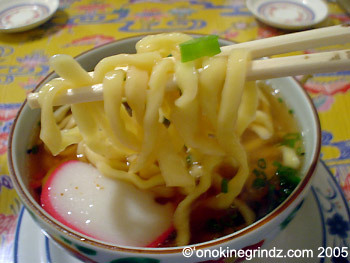 Here is a close up of the Okinawan soba noodles. See how the noodles are thick and somewhat flat? These noodles are usually made using wheat flour instead of buckwheat flour, which is what traditional soba noodles are made from. These noodles were firm and slightly chewy -- perfectly cooked if you ask me. 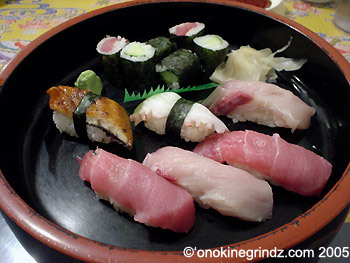 The other two ordered the sushi combination with the special miso soup (US$12.00). 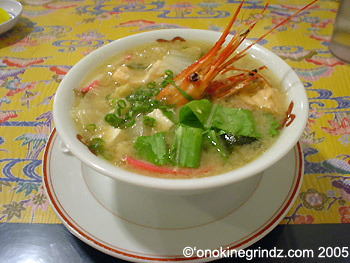 The miso and shrimp flavored broth was garnished with a slice of kamaboko, some chopped green onions and a shrimp head. After digging through the bowl of soup, we discovered it filled with all sorts of stuff -- bean sprouts, tofu, luncheon meat (! ), wakame (seaweed), salmon, daikon and Chinese cabbage. I'm not sure if I missed anything, but if I did, it's because there was quite a bit in that little bowl of soup. This was the sushi platter that was served with our combination meals. It contained three pieces of tekka maki (tuna roll), three pieces of kappa maki (cucumber roll), two pieces maguro (tuna), two pieces hamachi (yellowtail), one piece tako (octopus), one piece unagi (eel), a pile of gari (pickled ginger) and a mound of wasabi. The fish was fresh, and I felt we were given a nice assortment of sushi. 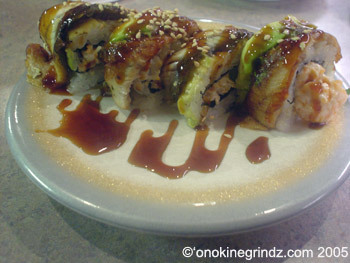 As always, my favorites were the hamachi and the unagi. The food here at Sunrise is good, and to some, it's just like homemade. Even though the portions may seem small, by the time you're done eating, you realize that you're full. All those things, along with the homey atmosphere, the prompt service and the not-so-usual flavors and dishes, give me enough reasons to keep coming back. A late night at the office led to dinner at Rai Rai Ramen with a couple of friends. I had heard quite a number of things both good and bad about the food here, but I decided that I needed to find out for myself. When we arrived at 8:30 pm, there was only one other person here and by the way she spoke with the waitress, she seemed to be a regular here. The shop was clean and brightly lit and there were menus on all the tables under glass which made for easy reading. After looking over the menu, two of us decided to try the kim chee ramen (US$6.50). When the ramen arrived, I was pleasantly surprised to see that there was a lot of kim chee in the bowl. This was my first time eating kim chee ramen, so I was quite excited to see what it would taste like. Let's just say that after the first few sips of the broth, the excitement went away. I don't know if it was the kim chee, or if it was the broth itself, but it was quite salty. The kim chee gave the broth a bit of sour spiciness, which was OK. I just don't think it worked well with the miso-based broth this time. The two of us agreed that the kim chee ramen was not something we would order again. 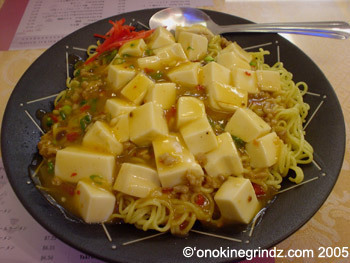 My other friend at the table decided to have the mabo tofu yakisoba (US$6.25). I've never had yakisoba with mabo tofu before and neither had my friend, but then again, that's why this was interesting. I was told that the mabo tofu was not spicy enough, but that it went quite well with the yakisoba. 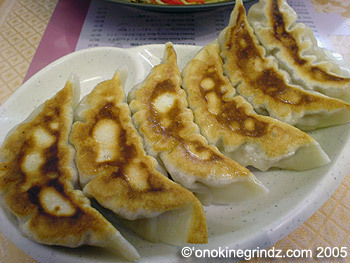 The three of us also decided to split a six piece side order of gyoza (6 pieces US$3.25; 4 pieces US$2.50). After mixing up some dipping sauce with vinegar, shoyu and hot chilli oil, I was ready. 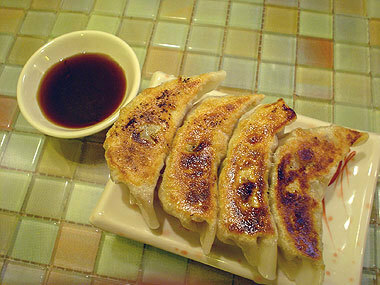 These gyoza were plump, nicely filled and steam fried just right. The filling, which was made of minced pork was quite tasty, however, I felt the gyoza skins were just a little on the thick side. 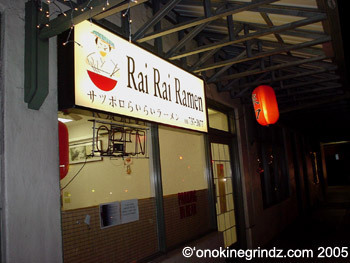 The ramen here at Rai Rai wasn't bad, but it wasn't outstanding either -- it was just so-so. Maybe I can be blamed for the choice that I made, but I honestly think that if you do something, you should do it well. The mabo tofu yakisoba was OK, but could have used a lot more heat (according to my friend). The gyoza was also OK, but could have been prepared with a thinner skin. The prices were on par with most of the other ramen shops in town (or maybe slightly lower) and the service was OK as well. This was definitely a dinner that left me wanting just a little more of everything. 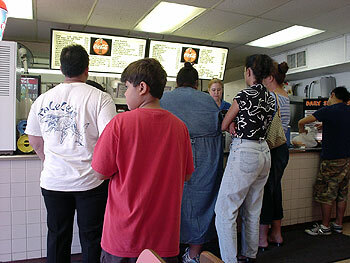 I'm still searching for a really nice, authentic Thai restaurant here in Honolulu. There are a few places that do a dish or two quite well, but then once I start eating some of the other dishes, things start to fall apart. I've heard quite a few good things about Bangkok Thai from some friends so I decided to pay the place a visit. 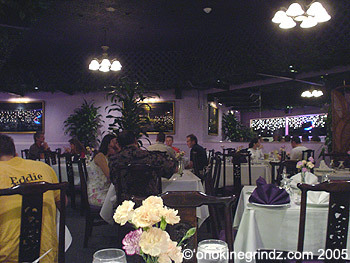 Bangkok Thai is on the corner of Kapahulu Avenue and Paliuli Street and when I arrived to meet a friend, I could not find parking anywhere. Luckily there was a noticed taped to the wall right next to the restaurant letting me know about the free parking at the Bank of Hawaii about 2 blocks away. Was it going to be worth all the trouble? After parking my car, I walked over to the restaurant. As I approached the restaurant, I noticed that it had a purple glow to it. Upon entering, I noticed that it was purple inside as well. 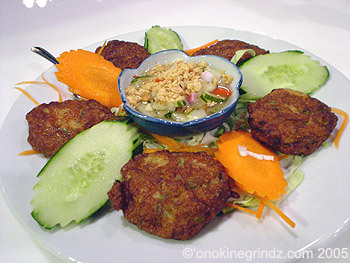 After looking over the menu, we decided to start with the fish patties (tod mun pla, US$6.95). The fish patties were served on a bed of chopped cabbage with some sliced cucumbers and carrots as garnish. In the middle of the plate there was some cucumber salad which is made by combining chopped cucumbers, shallots and chillies with vinegar and fish sauce, and topped with chopped peanuts. 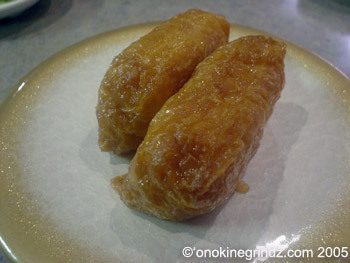 The fish patties were thick and meaty, and just a little oily. They were delicious and fragrant with just a hint of spiciness. I could definitely smell, and taste, the kaffir lime leaves that were used to flavor this dish and the cucumber salad served to add an additional layer of flavor to an already tasty dish. 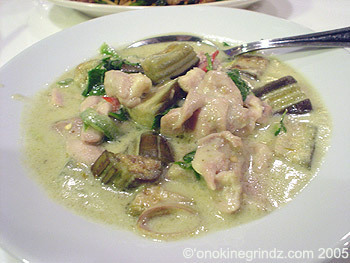 Next I decided to order the green curry with chicken (gaeng keow wan gai, US$7.50). Green curry with either chicken or beef is a favorite of mine and is a dish that I almost always order when I eat at Thai restaurants. The curry here was really too sweet and not spicy enough even though I asked for this to be prepared medium-hot. In fact, I don't think I tasted chillies at all. After a few bites, I decided that I couldn't eat any more of this. What I found really odd, is that in this particular green curry, there were a few pieces of red and green bell peppers. I don't think I've ever had bell peppers in a Thai curry before. And last, instead of a vegetable dish, which I should have ordered, I decided to order the Thai basil beef (pad kapao nuea, US$7.50). 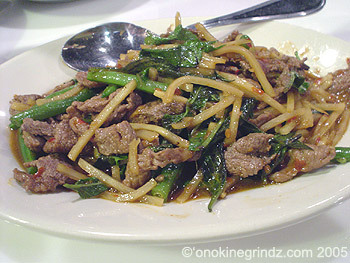 Tender pieces of lean beef were stir fried with some Thai basil, lots of bamboo shoots and a few long beans. The dish was served with a "gravy" made from fish sauce and a little soy sauce, among other things. This dish was also ordered medium-hot and came out a bit spicy, just the way I expected it to. The combination of flavors packed just enough of a punch to make this one of the better dishes of the night. 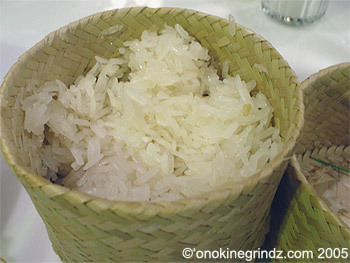 To go along with it all was some sticky rice (khao neow, US$2.00 per order/person). After all of that, I decided on some dessert -- the menu called this apple banana (US$3.00). 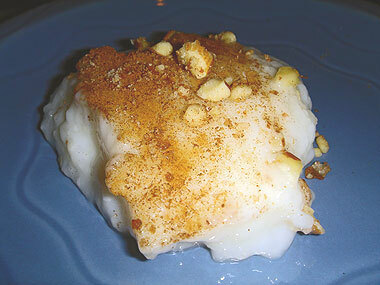 It was some Thai tapioca served warm with some cooked apple banana and coconut milk poured over the entire dessert. The comination of smooth tapioca pearls, coconut milk and slightly tart bananas made this quite delicious. I just wished that the bananas were a little softer and not as firm as they were. In addition to the parking issue, I felt that the food at Bangkok Thai was a definite letdown, especially since it was given the thumbs up by quite a number of people. The dishes here were a bit "hit and miss" tastewise, but the service was quite good and the prices are about what you'd pay at most other Thai restaurants. I would not go out of my way to dine here, but if I were in the neighborhood, I might be convinced to stop in to try some of their other dishes. Years ago, I used to visit Grace's quite often, now it's become one of my old stand-bys. 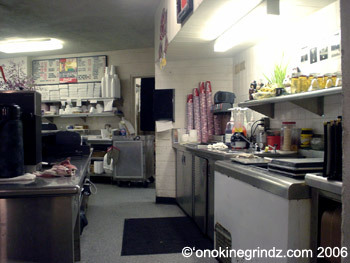 For me, it was one of those places that I knew served decent food, but never was compelled to go out of my way to visit. Well, a couple of days ago, I found myself at Market City Shopping Center. 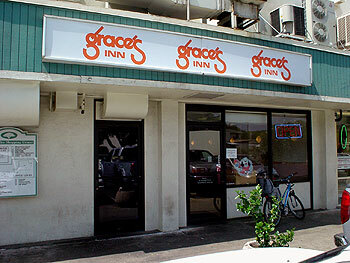 Not wanting to eat at either Gina's or Sumo Ramen, I decided to visit Grace's. 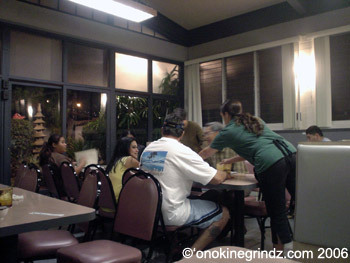 When I got there, it wasn't busy at all -- in fact, only one table in the place was occupied. Right after I had placed my order and sat down at a table in front of the counter, the place started to fill up. I ordered the mochiko chicken plate (US$6.25). 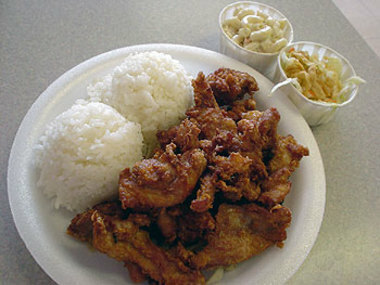 Each plate comes with two scoops rice, a bit of chow fun (which is hiding under all the chicken) and your choice of two salads -- tossed, macaroni, Asian cole slaw and kim chee (I think). 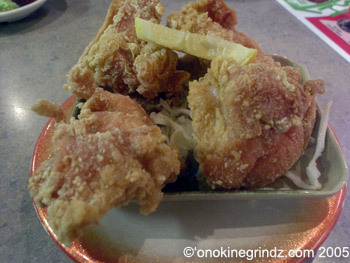 The mochiko chicken was deep-fried, extra-crispy and super crunchy. The pieces were slightly larger than bite-sized and very flavorful. Despite being deep-fried, the chicken was still moist inside, and surprisingly, not greasy or oily. The chow fun, on the other hand, was a bit dry and lacking in flavor. 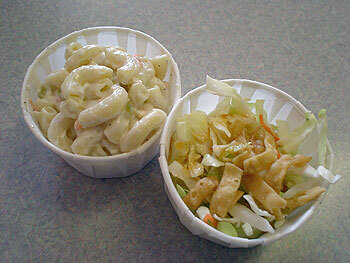 Here's a picture of the salads I chose -- macaroni on the left and Asian cole slaw on the right. The macaroni in this salad were still quite firm. The salad was made by mixing the macaroni with mayonaisse and pickle relish for a slightly different taste. The macaroni salad was good because there wasn't too much mayonaisse mixed into it. I only wish that the macaroni had been cooked longer so that it would have a bit less "bite". The Asian cole slaw, on the other hand, was very tasty. It was bits of cabbage and carrots combined with a spicy vinegar-sesame dressing. It was topped with a few strips of won ton pi and it was great. The textures and flavor combination made this a winner. Every now and then, when I'm in the area, I'll stop by Grace's. It's not one of my favorite places, nor is it a place that I'd drive out of my way to visit. But the food is decent and somewhat of a good value. I have driven by the Pyramids many times and each time I tell myself I'm going to stop. Well, stop I did. It was the Friday before New Years' Day and I had the day off. Lucky Me. 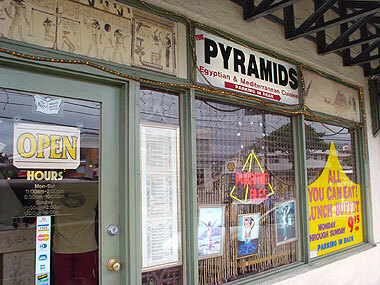 That meant that I could visit the Pyramids for their all-you-can-eat lunch buffet for US$9.95. Even though I arrived for a late lunch, at 1:15 pm, the place was crowded. All of the tables in the front half of the restaurant were occupied. The hommos, is a dip made from garbanzo beans, tahini, garlic, olive oil and lemon juice. While it was nice, it didn't have enough flavor for me. Something was lacking, but I really couldn't put my finger on it. The beef and lamb shawerma are marinated and cooked on a spit. 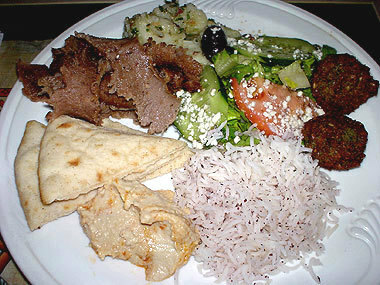 Once the meat has been cooked, it is thinly sliced. These strips of beef and lamb were perfectly seasoned and quite juicy. Taking the strips of meat from the bottom of the pan helped, they were a lot more juicy than those on top. The Greek salad was crumbled feta cheese, sliced tomatoes and cucumbers, and a few kalamata olives on a bed of romaine lettuce. Tossed with some of the house dressing this was light and refreshing. The amount of dressing that the salad was tossed in was just right. 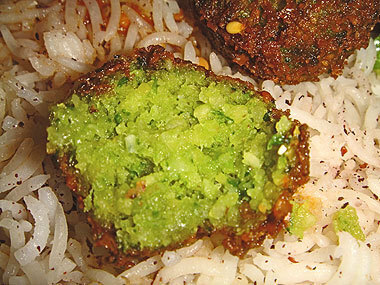 Next to the shawerma and the Greek salad, the falafel was the next best item here. It was crunchy on the outside and moist on the inside. Didn't realize it was so green on the inside until I took this picture. Falafel can be made with either fava beans or with chickpeas, and these were made with fava beans which is why they are so green (thanks Jonny for the info!). It was quite tasty and they actually looked like small meatballs. I ended up eating about a half dozen of these before I even realized it. For dessert, there was only one item on the buffet, homemade rice pudding. 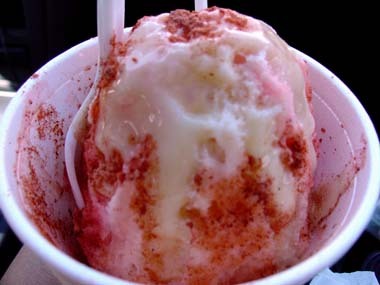 It was smooth and creamy with just the right balance of sweet spiciness. The cinnamon and nutmeg really helped make this delicious. I also liked the fact that there were quite a few nuts sprinkled on top. The crunchiness of the nuts provided a great contrast to the smoothness of this dessert. 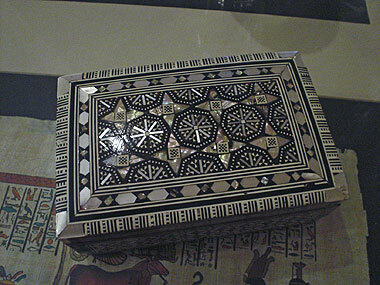 When I was done eating, the waitress presented me with a little box. Inside, held the bill for my lunch. Interesting touch. After years of driving by, I finally got to try the food here. I must say that I was quite pleased with the dishes that I had. I'm actually thinking of returning during dinner time so I can watch the belly dancers while sampling dishes from the à la carte menu. A couple of weeks ago, I was at Market City Shopping Center having dinner at Gina's B-B-Q, as I was leaving, I noticed Sumo Ramen & Curry. The shop had not yet opened, but I made a mental note to come back and try it after it had opened. A few days ago, one of my co-workers told me that she had eaten at Sumo Ramen & Curry and that the food was pretty good and quite reasonably priced, so I decided that I would drop by. 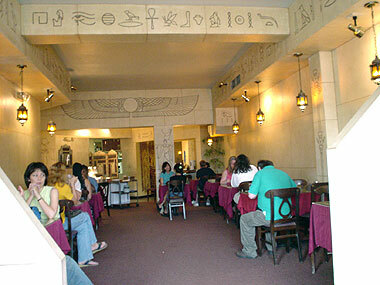 Upon entering there is a long entryway which leads to an open seating area in the back. 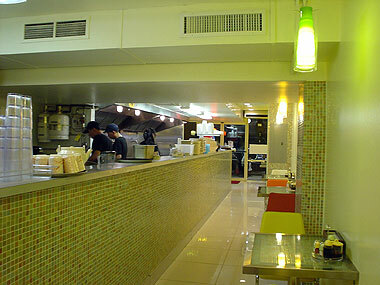 The shop was well lit and had some nice pastel-colored tiles on the counters, on the walls and on the tables as well. There were two guys cooking and two girls serving food. 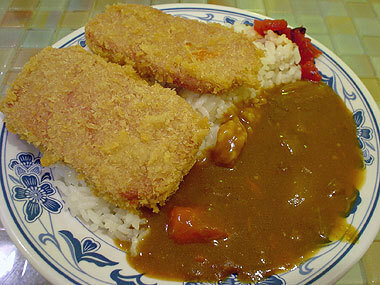 After glancing over the menu, I decided to have the Spam® katsu curry combo (US$6.95). 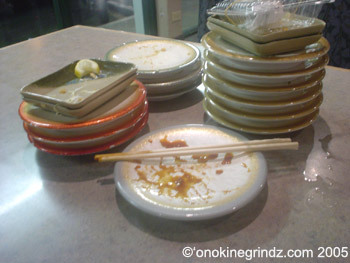 Included in the combo was Spam® katsu curry, a mini charsiu ramen and four pieces of gyoza. First to arrive was the Spam® katsu curry. 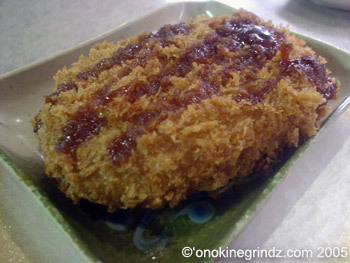 Two pieces of Spam® luncheon meat had been coated in panko flakes (Japanese-style bread crumbs) and deep fried. The Spam® "katsu" was served on white rice with some fukujinzuke (pickled vegetables) and curry sauce on the side. The Spam® katsu was something different and not all that bad. The curry sauce on the other hand was a bit too sweet for me. I added some shichimi togarashi to the dish, but it didn't really help. If you like your curry on the sweet side, then this is definitely the curry for you. 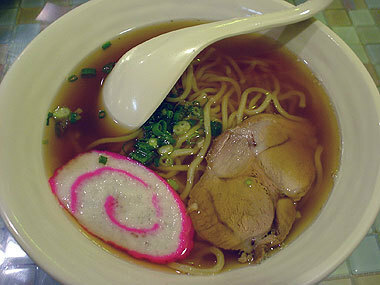 Next to arrive, was the mini charsiu ramen. As the waitress put the bowl on the table, I could smell the bonito in the broth (dashi). Thinking that this bowl of ramen would have some great flavor, I quickly had a taste. Boy, was I mistaken. The broth, while smelling really good and strong, tasted quite bland. I added some shoyu and shichimi togarashi to the bowl to give it a bit more flavor and kick. The charsiu was also a bit of a disappointment. It was tough and dry, not melt-in-the-mouth tender like it should be. Last to arrive was the gyoza. The gyoza was very nicely steam-fried. The bottom was just crisp enough to give this some crunch. It had just the right amount of filling and the gyoza skin was just the right thickness. This was not the best gyoza that I've had, but it was decent. 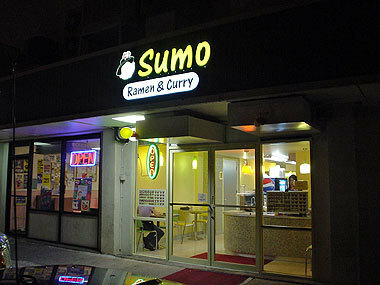 Sumo Ramen certainly gives a lot of food for the money, making this a good value if you're hungry. The Spam® katsu curry, gets high marks for its concept alone and is sure to appeal to locals looking for something new and different ways to try Spam®. Taste-wise, although the gyoza was OK, the curry sauce and the ramen's dashi, were both just average. Lately the weather has just been awful. Hot and humid, at most times it's just unbearable...OK, maybe I am exaggerating just a bit. After all, there are places with weather that is a lot worse! 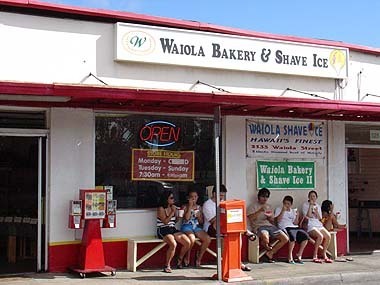 In any case, the weather is my excuse to get shave ice at Waiola Bakery & Shave Ice II. Self-proclaimed as "Hawaii's finest", Waiola is very popular with both locals and visitors alike. What makes this place so popular? Is it perhaps the shave ice? Super-fine and soft, this just melts in your mouth. Or is it the flavors? 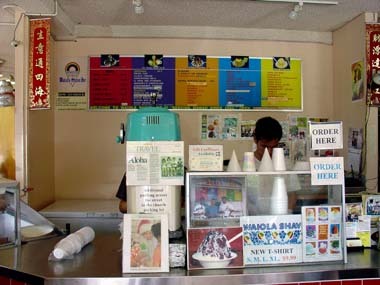 Waiola offers something for everyone, with many of the 35 flavors of syrup not found anywhere else. Or could it be the variety of toppings or add ons? You can add on everything from li hing powder to mochi balls to condensed milk. Or is it all of the above and more? With so much to choose from, there are literally hundreds of different combinations that one can try. All I can say is...delicious and refreshing! 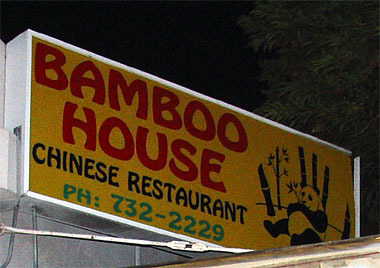 Thumbing through the recent Dining Out section of my Sunday newspaper, I ran into a tiny ad for a Chinese restaurant called Bamboo House. Having never heard of this place before, I decided on going there for dinner. I called a couple of friends and off we went. Once there, we found the place packed. We waited a few minutes for a table to open up before going inside. As we were being seated, a woman introduced herself as the owner and asked how we heard about the place because we didn't look familiar. Seems as though this restaurant has only been open for about 6 months and most of the patrons are her friends. After placing our order, the owner of the shop brought us a dish at no charge. Now how often does this happen? We were told that this dish was called parchment chicken. 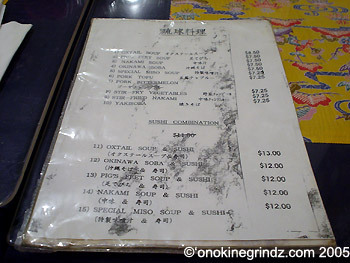 (On the menu, the price is US$4.95). 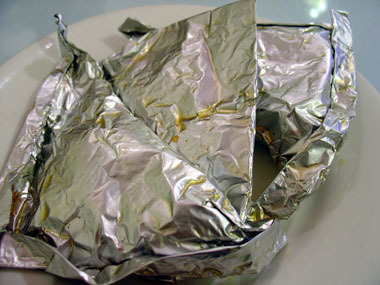 Wrapped in the aluminum foil "parcel" was a nice sized piece of boneless chicken meat. The chicken was tender and juicy. Tasted a bit of wine (we were told it was saké) and ginger. Yummy! 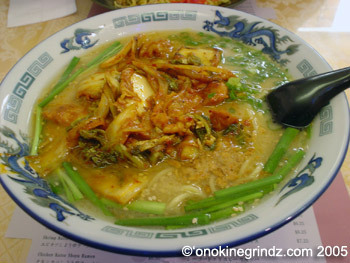 To start, we ordered the seafood with fish mau soup (US$4.95). This soup was full of fish maw and pieces of shrimp. The soup was smooth and silky and had such a wonderfully light flavor. 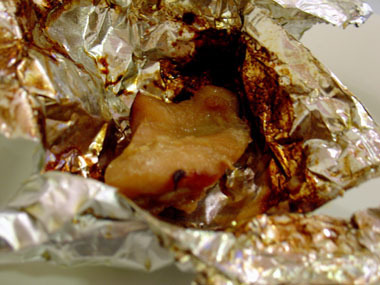 The fish maw was cooked perfectly and retained all of its wonderful texture. Next to arrive was the kung bao beef (US$5.95). 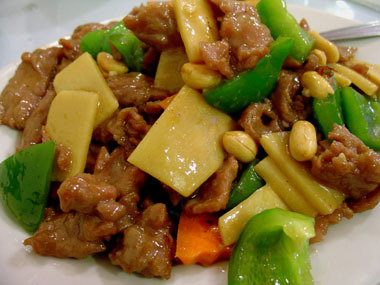 There was a lot of tender beef in this dish, as well as lots of bell pepper, peanuts, carrots and bamboo shoots. Normally, kung bao beef should be hot and spicy. Sadly, this dish lacked the chillies and any hint of spiciness. As you can tell by the photo, this dish was quite oily. Perhaps the next time, I'll ask for less oil and more chillies to be used in the preparation of this dish. 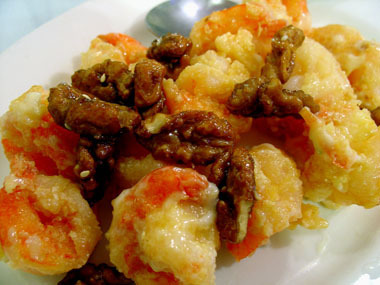 Following the kung bao beef was the mayonaisse prawns with honey walnuts (US$6.95). 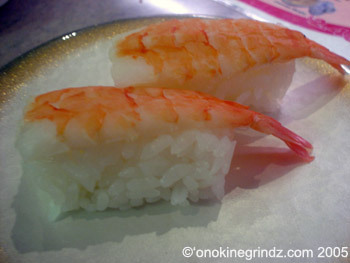 There were quite a few prawns (shrimps) on the plate, though they were a bit on the small side. The prawns were nicely deep-fried and crunchy. Coated with just the right amount of mayonaisse this was perfect. Topped with honey-glazed walnuts made this one of the better dishes of the night. 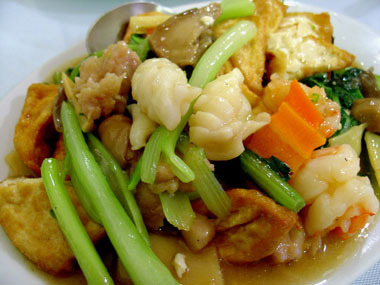 The final dish to arrive was the braised tofu with assorted seafood and meat (US$5.95). The tofu is served with lots of vegetables, choi sum, carrots, celery and mushrooms, as well as with shrimp, squid and boneless chicken. The sauce is light and not at all over powering. This dish was perhaps my favorite. Very subtle flavors made this dish delicious without being too bland. We certainly ate quite a bit and even though there were a few small misses here and there, for the most part it was delicious and well worth the money. This will probably become one of the Chinese restaurants that I come back to time and again.